Every once in a while, we come to a point in life where we realize that our past has flown so fast and a new begining unfolds. It is also a time to cherish all those that have put a mark in our lives over the years and move forward to new foot prints to our journey in life. Throughout 2012, my life has had many ups and downs but this is what life is made of... my life at least. If one were to ask if I would change anything, I probably would not. 2012 has made me stronger in every emotional and physical aspect and I am looking forward to 2013 to mark down my journey happily. May You All Cherish Every Moment of Your Lives with lots of Health, Wealth and Love always! 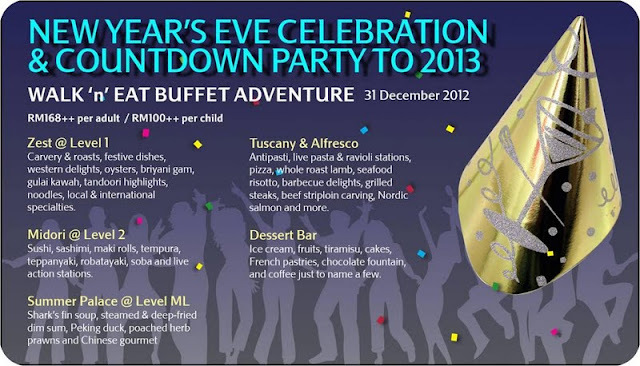 Putrajaya Marriot Hotel & Spa, Sepang: Let’s Count Down to 2013 with a Walk N Eat Buffet Adventure! More Mirth & Merriment with Marriot Walk N Eat Adventure! Time sure flies when fun and merriment is everywhere! Just right after the Christmas festive, everyone is surely looking forward to another new year in 2013. As what the popular quote says, ‘When you’re in Rome, do as the Romans do’, so when one is in Malaysia, let’s do what Malaysians do all the time… EAT! 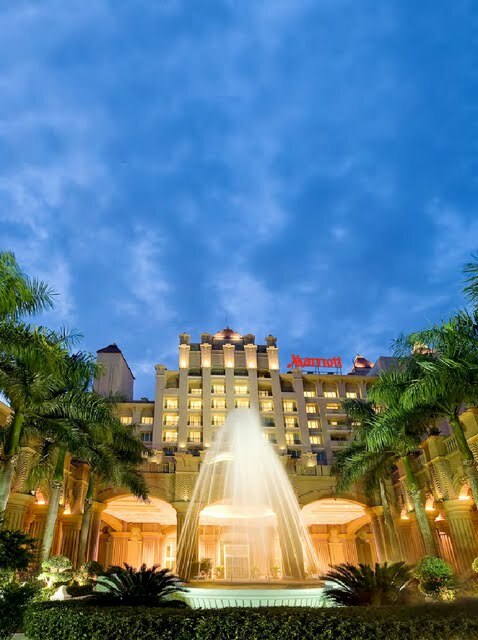 This New Year’s Eve, Putrajaya Marriott Hotel & Spa is proud to host the season’s best fiesta and celebration with Marriott ‘Walk & Eat Adventure’ and ‘Countdown Party’ at the brink of New Year, 31st December 2012. The gastronomic adventure showcases Putrajaya Marriott’s master chefs’ culinary delights from the entire hotel’s restaurants. Walk from restaurant to restaurant and savor wondrous list of food for the price of one. So, pay ONE price and walk your way to the following locations and enjoy a culinary feast to usher in the New Year! At Zest, there is a gorgeous spread of bountiful offerings from carvery & roasts, festive dishes, western delights, oysters, briyani gam, gulai kawah, tandoori highlights, noodles to local and international specialties. Stars of the adventure include a Whole Roast Lamb, Barbeque Seafood and Baby Quail, Rack of Lamb and one of my all-time-favorite, Beef Wellington. Plenty of sides of Sauteed Vegetables, Mushroom Quiche and Baked Potatoes with gravy will keep the carvery happy for meat lovers! Go Chinese and savor Shark’s fin soup, steamed & deep-fried Dim Sum, Peking duck, Poached Herb Prawns and Chinese gourmet preparations at Summer Palace Chinese Restaurant! If you must, then head over to Midori Japanese Restaurant for plenty of Japanese fare like Sushi, Sashimi, Maki rolls, Tempura, Teppanyaki, Robatayaki, Soba and live action stations… I know I certainly would! Italian foodies are also spoilt for choice at Tuscany Italian Restaurant & Pizza Bar with their big spread of luscious Antipasti, live pasta & ravioli stations, Pizza, Whole Roast Lamb, Seafood Risotto, Barbecue Delights, grilled Steaks, Beef Striploin carving, Nordic salmon and more. 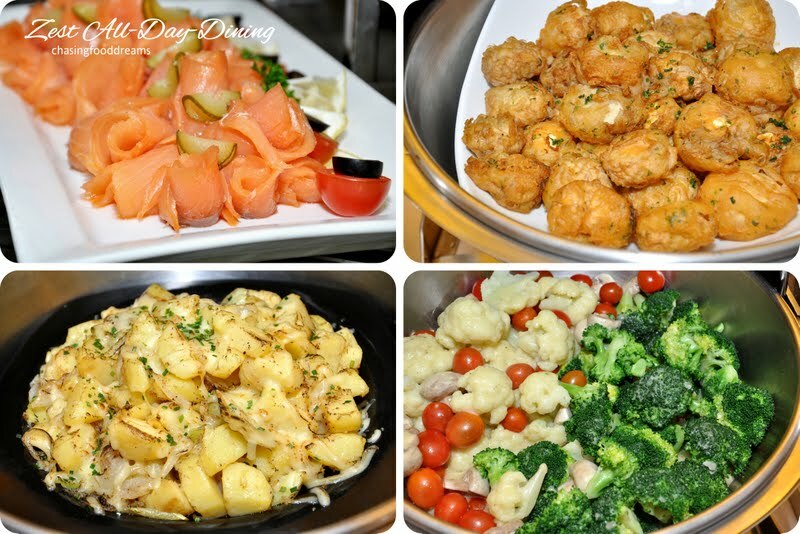 The barbeque delights are simply superb while pizzas are another must! We savored a gorgeous Black Squid Ink pasta with tomato sauce and a Spinach Fettucine with Carbonara sauce. The wood fire pizzas are just so good, I couldn’t get a photo fast enough as everyone wanted a slice. 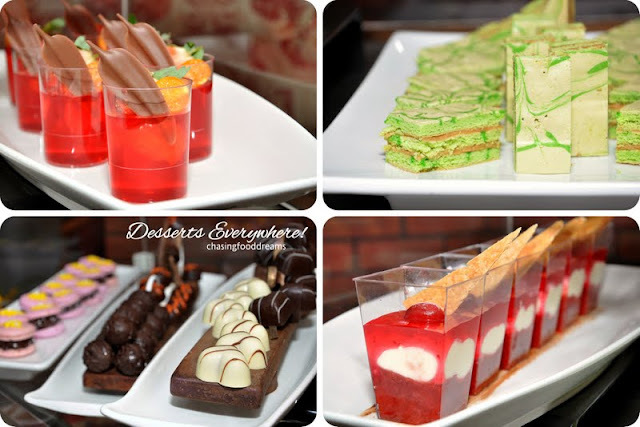 Don’t forget to make way for desserts! Desserts are just everywhere in all the restaurants and are so tempting, you wish you have more than one stomach for them alone. 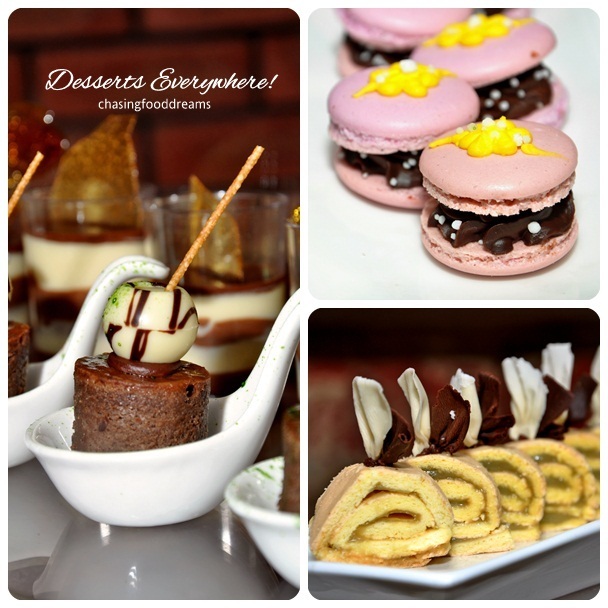 From French Macarons to a tower of Brownies and Strawberry Cake, the desserts are a hard choice to pick. Puddings, Jello, Cakes, Pastries, Sweets and Chocolates also graced the dessert bar! If your tummy has had just about enough to keep you dancing all night long, then head on down to the Lobby Lounge for the Countdown to 2013. The year-end brings no greater pleasure than to get together and watch the clock strike midnight. Heart stomping entertainment await with the countdown band, DJ’s party & dance music, spot dances & prizes, balloon drop, party novelties, magical roving clown and hotel New Year’s Chef’s Parade. Come and join in the fun of joyous new beginnings. After all, it is your turn to enjoy for the year round of hard work. 31st December 2012 ONLY and is priced at RM168++ per adult and RM100++ per child. Here's Wishing Everyone a Blessed Merry Christmas! Simplot Popcorn Hash Brown: Express Canapes for the Holiday Season! Impressive Your Guests But Don’t Sweat It! I love potatoes! My Archilles’ heel has always been potatoes and rice. A light bulb went off and I have decided to make this simple and delicious popcorn hash brown into decadent canapés. Don’t be judge by this affordable Simplot popcorn hash brown. Once I finished with these baby tater tots, they are going to look so lavish and sumptuous! Potatoes really go with anything, so these tater tots are really versatile in blending in with other ingredients and flavors. I decided to make them into Russian, American and Mexican canapés. Taking the basic recipes of the original canapés, I substituted the base of the canapés with Simplot Popcorn Hash Browns. Going creative, I pan fried a few of the popcorn hash browns till a little soft and squashed them with a masher tool. Once you have smashed them, leave them to fry till golden on one side before turning them. They are fragile till they are golden crisp on one side, then you can flip it over and pan fry the other side till golden. The disc of popcorn hash browns are now ready to be topped with your choice of filling. Here’s where I vamped them up with my favorites. Really, there is no limit to what filling one can top on these crispy Simplot Popcorn Hash Browns. Go Asian with Chili Sardines and Mango Salsa, Spanish with Chorizo Sausage and Cheese, Chinese with Smoked Duck and Hoisin Sauce and so much more! Served them in soups, bakes, pies, and more as their versatility is just endless. Make them into breakfast or simply snack on them. Once I had them with soup and it was delicious as the crispy tater tots goes so well with the Minestrone soup! You can fry up or baked them in advance as they still remain crispy and delicious at room temperature. Dressed them up only when your party is about to start so the filling and sauce won’t make the crispy disc soggy! Chasing Food Dreams Simplot Popcorn Hash Brown Canapes for the holidays... Merry Christmas! Simplot Popcorn Hash Browns are made from premium potatoes without fillers. Bake or fry them without even defrosting. It’s definitely good to have some around anytime! Merry Cooking with Simplot Popcorn Hash Brown! 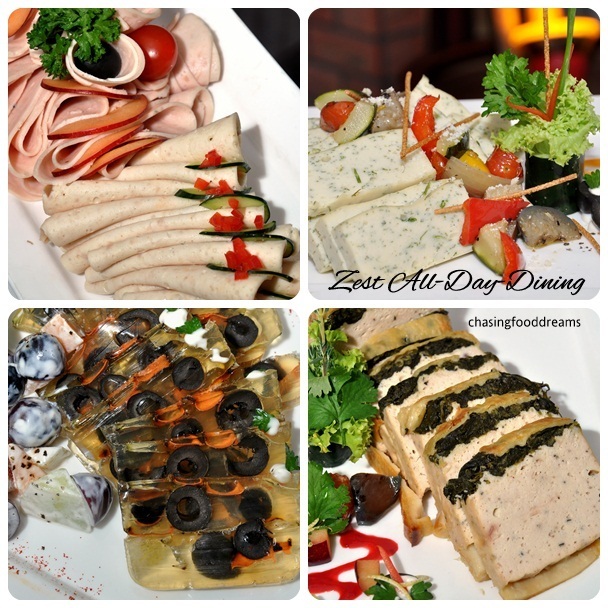 Ee Chinese Cuisine, Eastin Hotel Kuala Lumpur: A Feast of Barbeque Signatures for December! Chinese Barbeque with a Twist! When one mentions Chinese barbeque or roast, one immediately thinks of Roast Chicken, Roast Dock, Roast Pork and Char Siew. Here at Eastin Hotel Petaling Jaya at their Ee Chinese Cuisine, barbeque is more than the norm. For the whole month of December, foodies are treated to Chef Yong Kam Wah’s barbeque signatures of roast meats and a little more! I too had the same thinking, expecting the usual roast meats that night. So when the menu was presented, I was astonished and delighted to see lovely unique dishes that had me salivate even before the meal started. Yes, the usual roast meat is served but foodies should definitely check out Chef Yong’s twist on barbeque signatures. Jumping right in, the barbeque escapade took off with a rendition of the infamous Peking Duck. Cleverly twisted, Chef Yong’s version was a Smoked Duck & Crispy Bean Curd Wrapped with Egg Pastry. It had all the similiarity of the original dish of duck, cucumber and scallion served with hoisin sauce but vamped up with smoked duck and crispy bean curd skin for different textures. The next course of BBQ Rolls with Fresh Scallop and Prawn impressed me with its saucy flavors! A big piece of fresh sweet scallop, a succulent prawn, an earthy Shitake mushroom and crunchy bell pepper is held together on a lemongrass skewer. After being grilled till just cooked, the gorgeous seafood skewer is drenched in an unctuous creamy Mongolian sauce. Flavors are utterly divine with a little hint of peppery and creamy notes. I like the creamy sauce so much, I wanted to lap up the whole plate just to pay full tribute to the sauce! This soup is no stranger to my taste. In fact, the several times we had it here, there is always a sense of being mollycoddle by its flavors and warmness. Double Boiled Shark Bone Soup with Fish Maw is a house signature and will always remain a top favorite of mine. Boiled and reduced for hours, the essence and collagen of the shark bone has literally tainted the broth in a very delicious manner. Pure thick and sticky sensation bonded to our lips in an opulence manner. It really didn’t matter what other ingredients it had in the soup because I was just happy to be savoring the milky broth alone. When I saw Oven Baked Spare Rib in Tong Kwai Sauce, I snickered to myself in pleasure. The spare rib exuded a sight so pleasurable, I kept taking loads of photos to capture its glory. Well marinated, the ribs are baked for 20 minutes, rendering a deep amber color tainted with edges of caramelized bits. I can taste the aroma and flavor of Tong Kwai or Angelica Sinensis, a root renowned for its medicinal properties. Sweet, savory and a slight bitter note from the herb made the rib superbly mouthwatering in every bite. When this dish arrived, we literally drooled at the sinful aroma teasing our senses into frenzy! Taking inspiration from the West, we were treated to a Chinese twist on Oven Baked Lamb Cutlet with Chef’s Special Sauce. Simply baked to medium well, the lamb is so tender and moist. The rough blacken edges are just glorious on my taste bud. Dressed with ‘Mak Chap’ of Chef Yong’s secret sauce and a spicy green chili sauce, it was just an orchestra of flavors. That little mount of spicy green chili sauce packed quite a punch. With or without it, the lamb cutlet is still scrumptious with a sweet and savory note. The dish takes barbeque to new heights for Chinese cuisine. Chef Yong really outdoes himself in Stewed Noodles with Roasted Sausage! Extraordinarily unique in terms of creativity and pairing of ingredients, the Japanese thin Somen noodles sit on a bed of lightly steamed soft egg custard and crowned with wine roasted sausages. Soft noodles, soft wobbly egg custard and deep robust wine sausages meld beautifully like a perfect symphony. As I spooned into the custard, I was welcomed by a light and delicate clear consommé with an aromatic hint of fried shallot and spring onions. Slurping up the noodles, it was so comforting and welcoming. The pièce de résistance was the potent flavors of the wine sausages with soft nuances of the sweet meat filling. Some creations are just geniuses that turns classic and here is hoping this one will! The night has to come to an end sooner or later and we finished it off gracefully with Doubled Boiled Snow Fungus with American Figs and Sweet Duet. The sweet hot dessert was light and not overly sweet. I never tasted figs in a Chinese dessert so I really was surprised how lovely it was in flavors and textures. The bits of snow fungus were also really lovely as it had a similar texture to aloe vera. Never a fan of Chinese sweet dessert soups, I certainly don’t mind having another one of this! Sweet Duet is actually a savory pastry encasing minced meat with scallions. Chef Yong wanted to show off a contrast of a savory and sweet dessert for the finale. The flaky pastry with the savory filling is pretty decent but to me, it tasted like it belongs to the appetizer rather than dessert. As always, Ee Chinese Cuisine aimed to please and it always does! As mentioned earlier, the regular roast meats are also available in addition to the above signatures of Chef Yong. 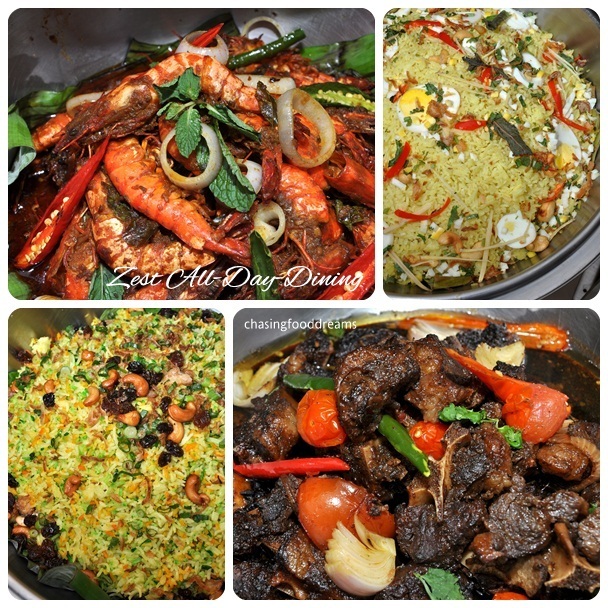 Do head over to Ee Chinese Cuisine for a taste as it is only available till end of December this year! For reservations, please call Ee Chinese Cuisine at +603 7628 7338 for more details. *My previous visits to Ee Chinese Cuisine here, here and here.